Quick as in, you've got 10 more days so quick, hurry! Crafty, as I'll explain. And I couldn't let the year go by without a Gift Guide! Kyoto based artist Mihoko Seki makes these must-have rubber stamps on a porcelain base. Even if your friend doesn't stamp, she's sure to appreciate how cute these things will look on her shelf! Available here. Why a letter opener when hardly anyone uses the postal service anymore? Because the few letters your friend does get next year, she'll want to open very carefully. Have you noticed people are selling "vintage" stamps? That's because they make really cute decoupage gift wrapping and note cards. Make sure to send your friend a couple of letters in the mail, too, so she can use the thing. Letter opener, $17.95. Your favorite crafter will need a Hand Crank Radio ($25) so she can listen to NPR while making her washi tape works of arts. This one is powered by solar energy or one minute of hand cranking which equals 30 minutes of radio time. She'll get a work out, too! I can't get enough of those old-fashioned key designs. This one is actually functional, too. Key chain, $20. I highly recommend the 60 Colored pencils in Tube ($28) from Muji. 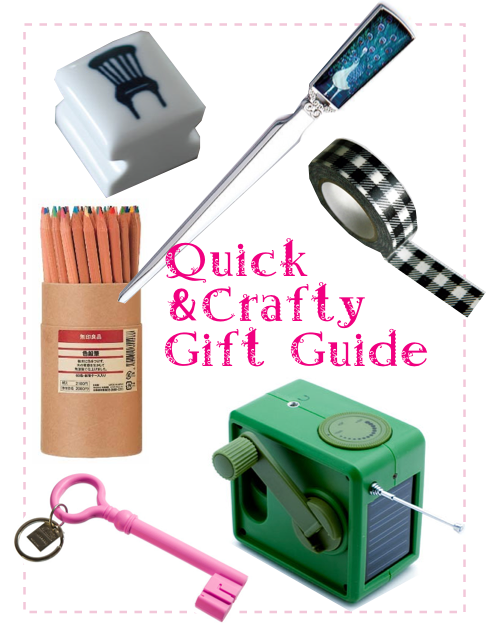 There you have it, my 2011 Quick & Crafty Gift Guide. I forgot to mention the other reason it's "quick" is because I've gotta run and make those chocolate oatmeal cookies for the swap tomorrow! I love the washabi tape. And you def can't go wrong with black and white checks, classic! Thanks for stopping by my blog! My pleasure! Your blog is super cute.